What is the Protect Plus System? Electrolytic Zincifying: where the zinc deposition into the steel happens by electrical effects. In the merger of the zinc to the steel, performed at high temperatures (above 500º C), some 5 to 7 % of the pipe’s final weight is added. With the Protect Plus system, there is no addition of weight to the end product, resulting in direct savings of the same order – from 5 to 7%. Zinc releases white oxidation, is a sacrifice material that superimposes itself to the steel in order to protect it, but it may become harmful to the environment exactly due to the release of such oxidation. Protect Plus does not oxidize, it forms a single body with the material where it has been applied, it is a “green”, ecological correct product. In the finishing of the installations, hot galvanized pipes need to be cleaned with the use of thinner, and as there is no good mechanical anchorage, it is necessary to apply a primer wash to serve as base to the final paint. With the use of pipes coated with Protect Plus, it is only necessary to perform a simple cleaning, water and soap based, to afterwards apply the finishing paint. For industrial applications, the products of WIEST Steel Pipes can be already supplied with the Protect Plus system, which will serve as base and – especially – as an anti-corrosive protection, resulting in higher operational efficiency at the production lines. Fundamentally, this is the differential when making such comparison: altering the conceptual base of mechanical anchorage by Chemical Grafting, with the advantages and benefits already mentioned above. 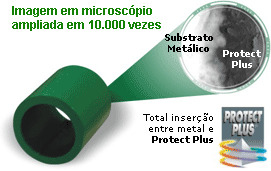 Such process adds a small portion of weight to the product, and as a disadvantage it has the fact of not providing internal protection for steel pipes, opposite to what happens with the Protect Plus system. Similarly, the superimposed zinc layer serves as sacrifice material, which also releases white oxidation, harmful to the environment.